This section outlines any major ACL changes between versions 2.5 and the 3.x series (which will include future releases). The table below summarizes the changes from version 2.5. 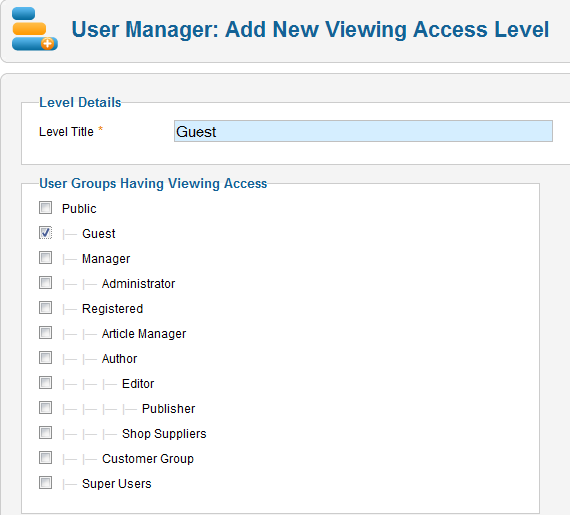 Create a set of Access Levels according to the Categories and/or the combination of categories you wish only logged in users to see. 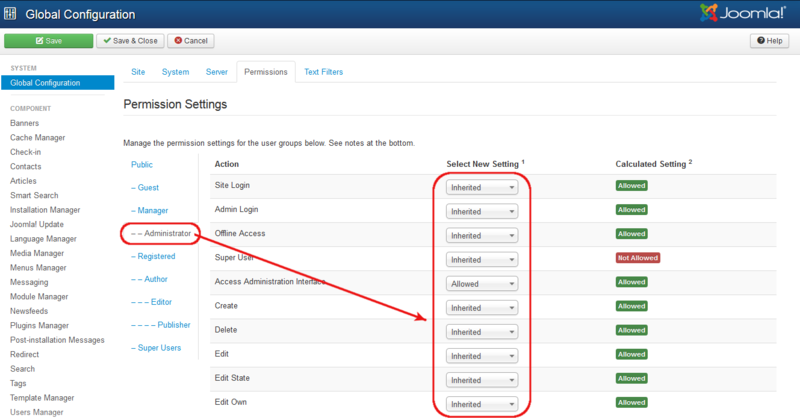 N.B do not assign any user groups to the new Access Levels at this point. 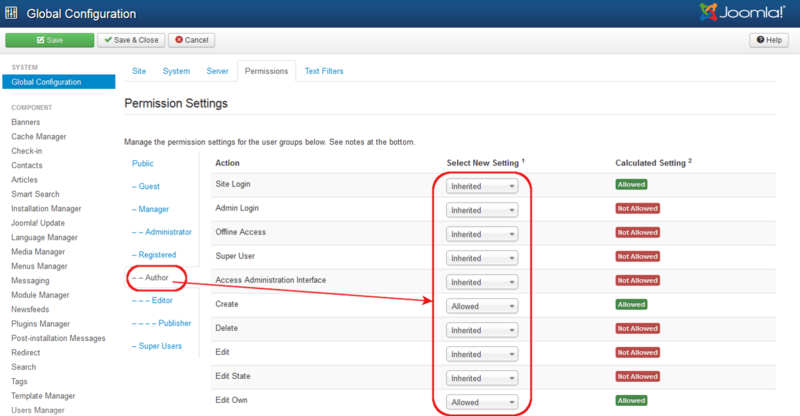 Create a User Group, with 'Registered' as parent, for each Access Level. 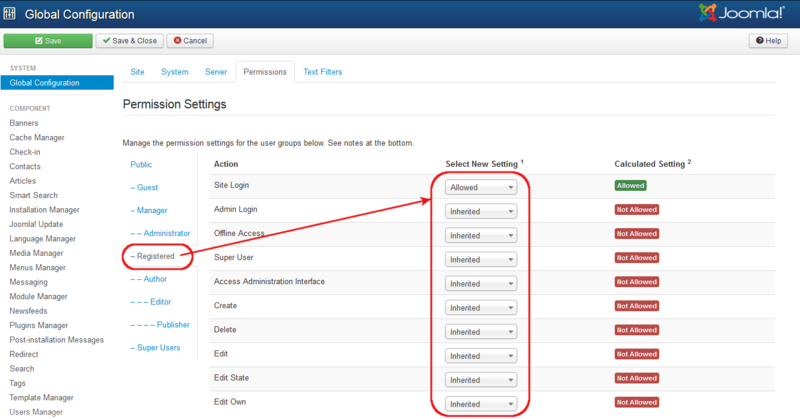 Using the same names for the User Groups as the Access Levels will prevent confusion later. 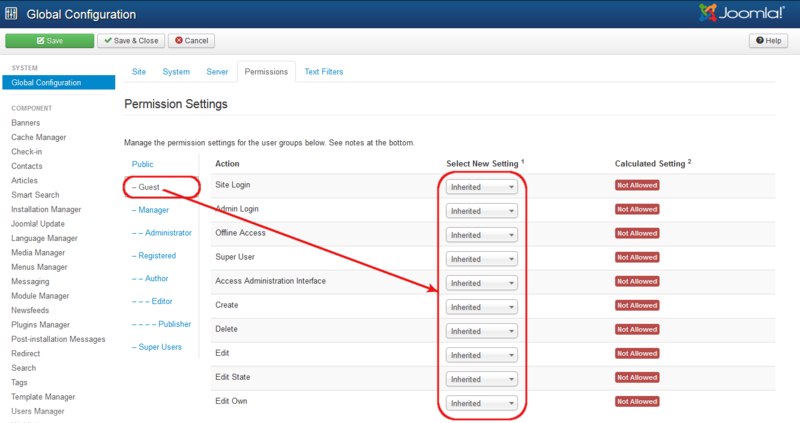 The system for setting up what users in a User Group can do -- what actions they can take on a given item -- is set up with the Permissions tab of Global Configuration and the Permissions tab of the Options screen of each component. 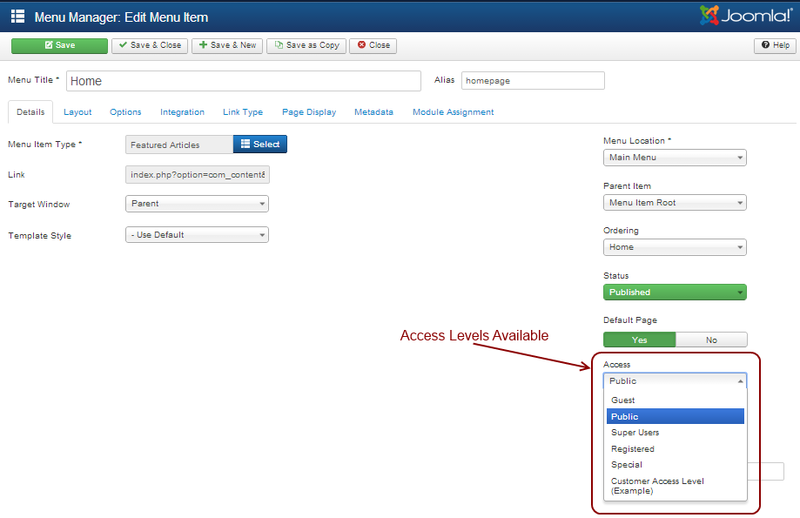 Permissions can also be set up at the Category level for core components and at the Article level for articles. 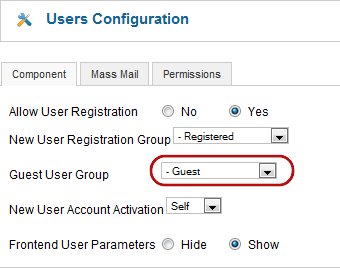 Create a User Group with the Parent as one of your User Groups that has Access to the Category(or Categories) you wish this new User Group to modify. 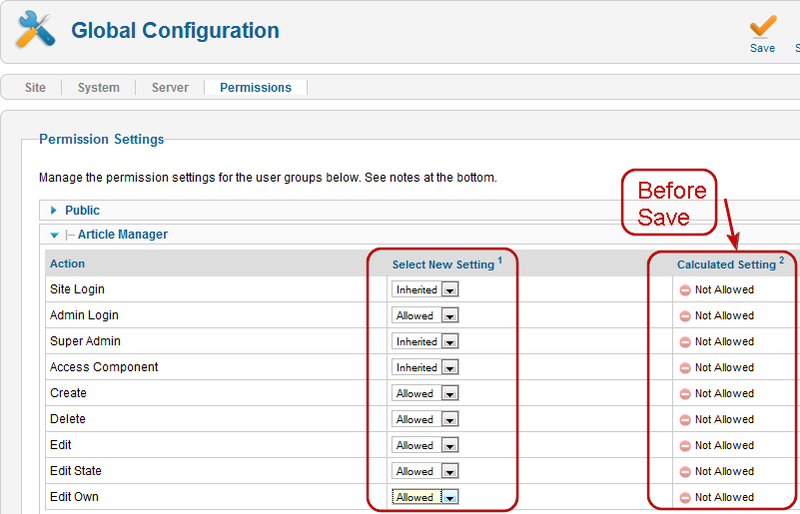 Assign your new User Group to the appropriate Access Level(s). 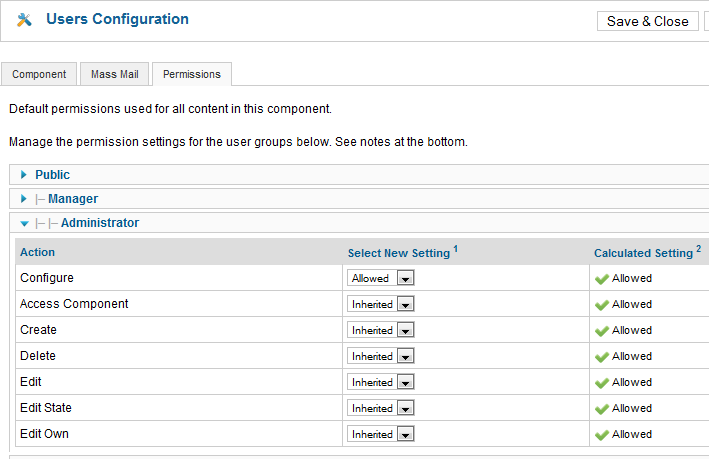 Then change the required permissions for your new user Group either Globally or per Category/Article. 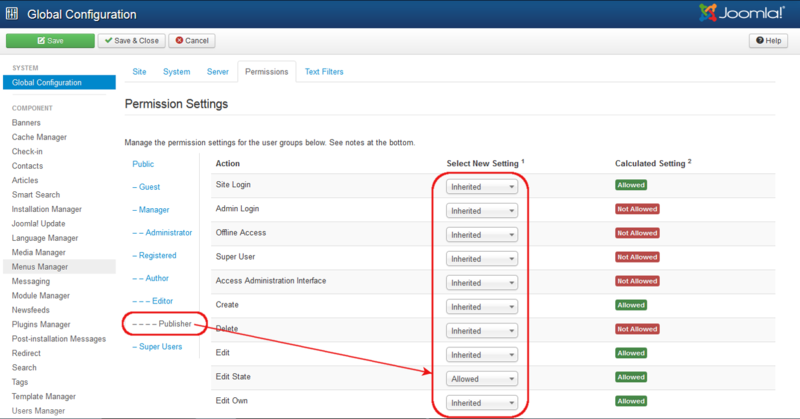 When creating a User Group it is good practice to select a parent group that has less permissions than needed for the new group. 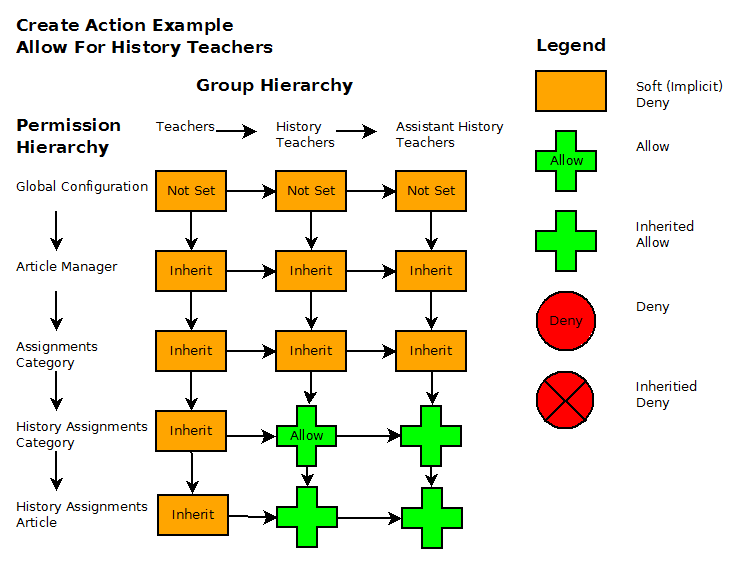 This is because it is easier to elevate permissions per Component/Category/Article that the extra permissions are needed for than it is to remove permissions from the other Components/Categories/Articles. 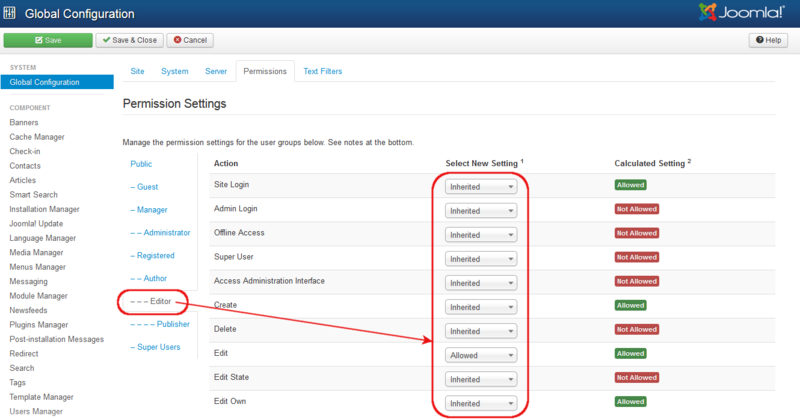 Note that this set up is independent of the setup for viewing but a User Group needs to be assigned to the appropriate Access Level(s) in order for the user in that Group to use those Permissions. 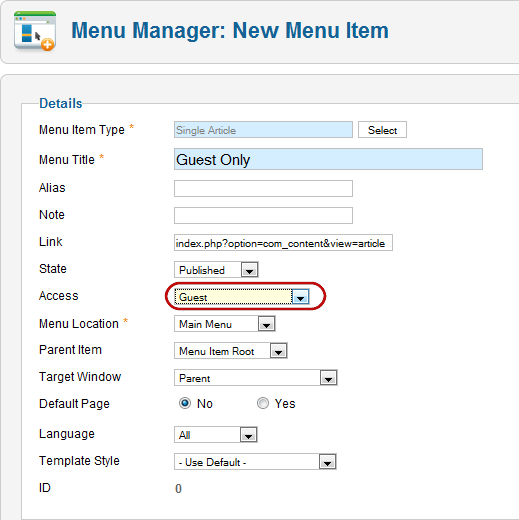 When a user wants to initiate a specific action against a component item (for example, edit an article), the system (after checking the Group the user is in has access) checks the permission for this combination of user, item, and action. If it is allowed, then the user can proceed. Otherwise, the action is not allowed. 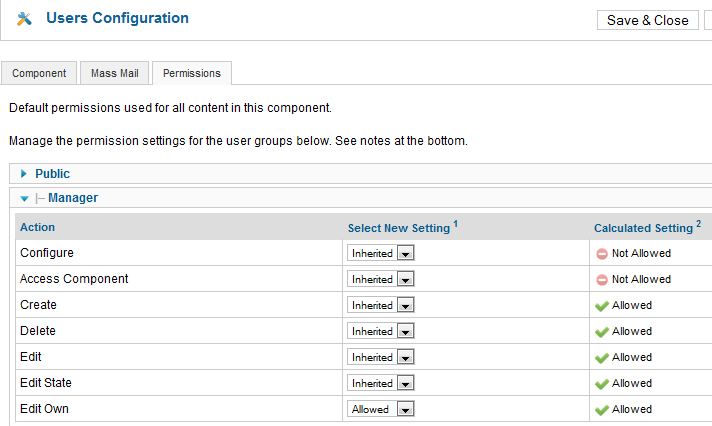 The other side of ACL is granting permissions to users to take actions on objects. 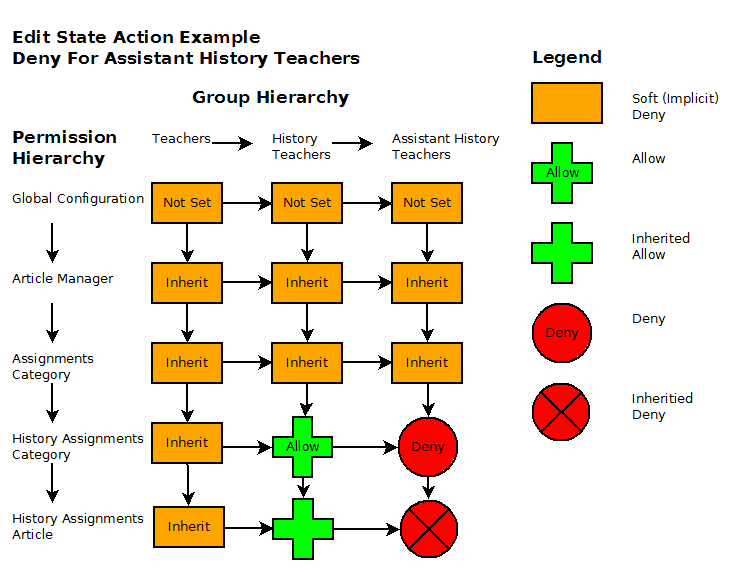 Actions allowed for each group are defined by site administrator. 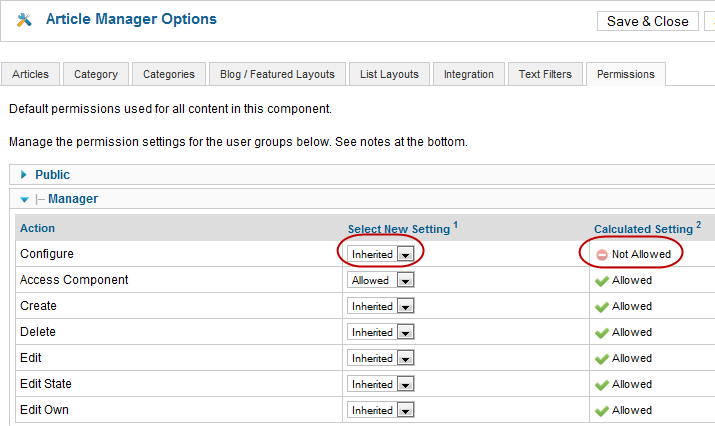 Permissions can be set at multiple levels in hierarchy: Site, Component, Category, Object. 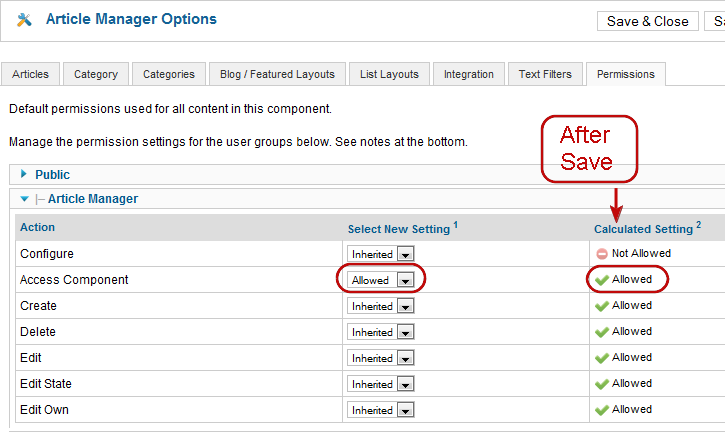 Component Options->Permissions: can override the default permissions for this component (for example, Articles, Menus, Users, Banners, and so on). 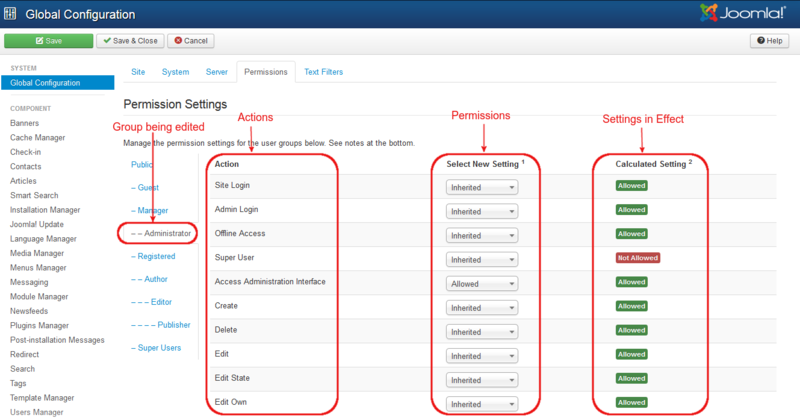 This is accessed from System → Global Configuration → Permissions. 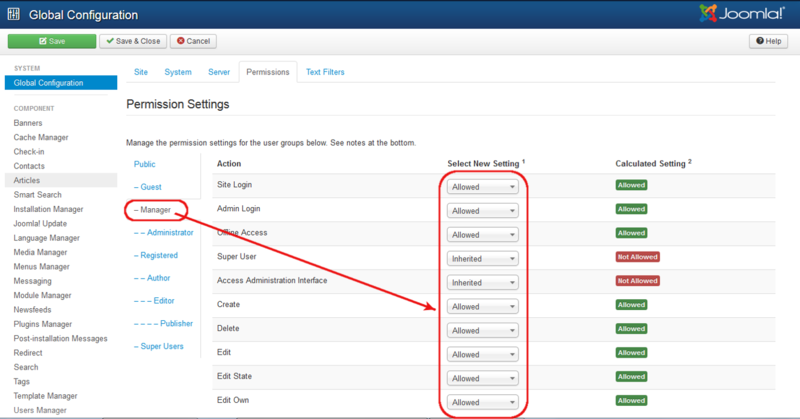 This screen allows you set the top-level permission for each group for each action, as shown in the screenshot below. 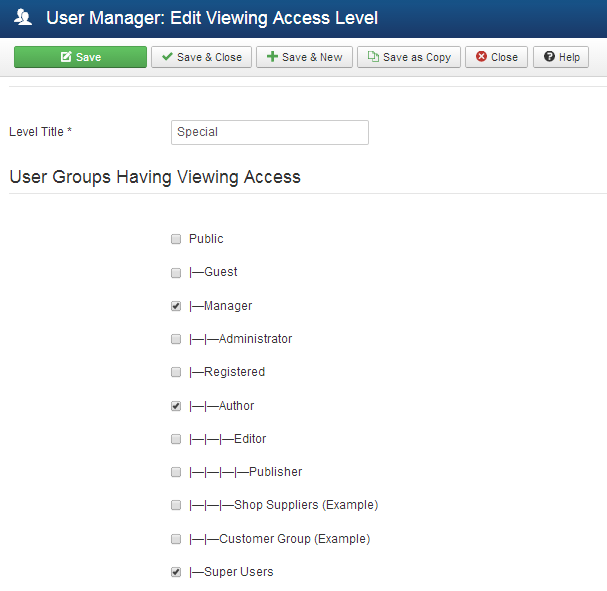 Category permissions are accessed in the Category Manager: Edit Category screen, in a tab at the top of the screen. 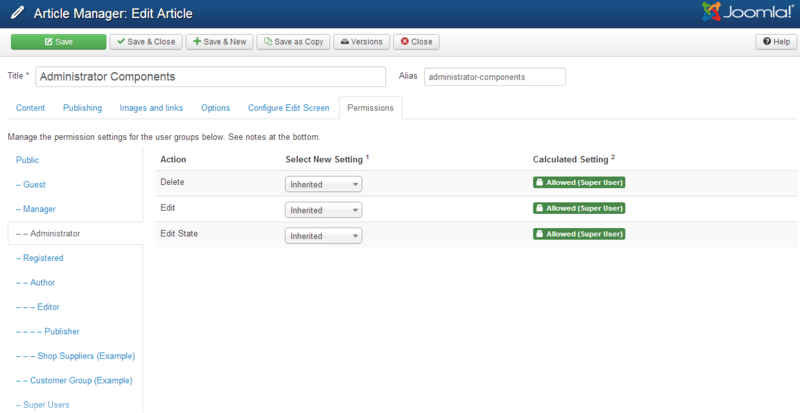 This screen has five permissions, as shown below. Access Levels in 3.x series are simple and flexible. The screen below shows the Special Access Level. 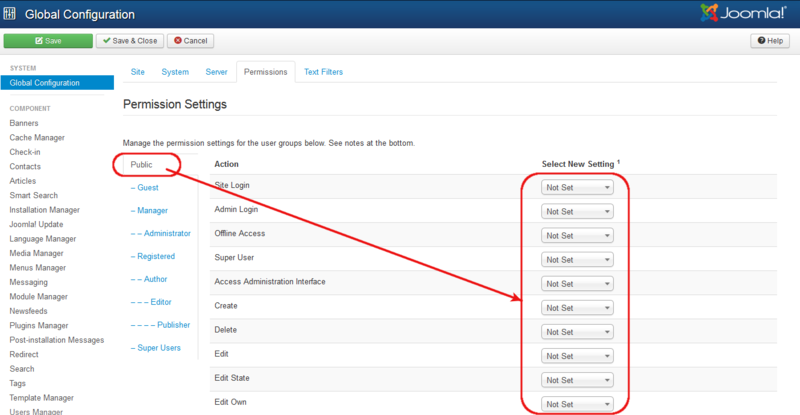 Simply check the box for each group you want included in that level. 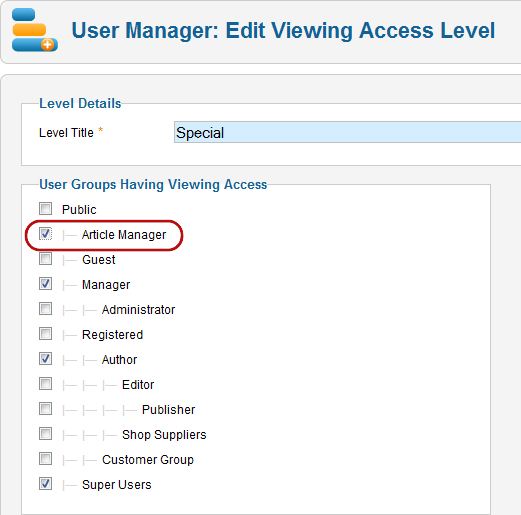 The Special Access Level includes the Manager, Author, and Super Users groups. It also includes child groups of those groups. 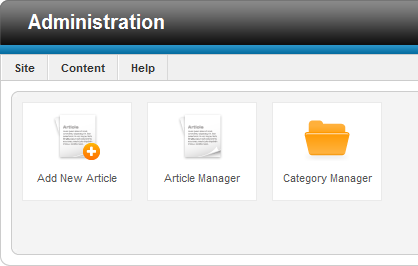 So, Administrator group is included, since it is a child group of the Manager group. 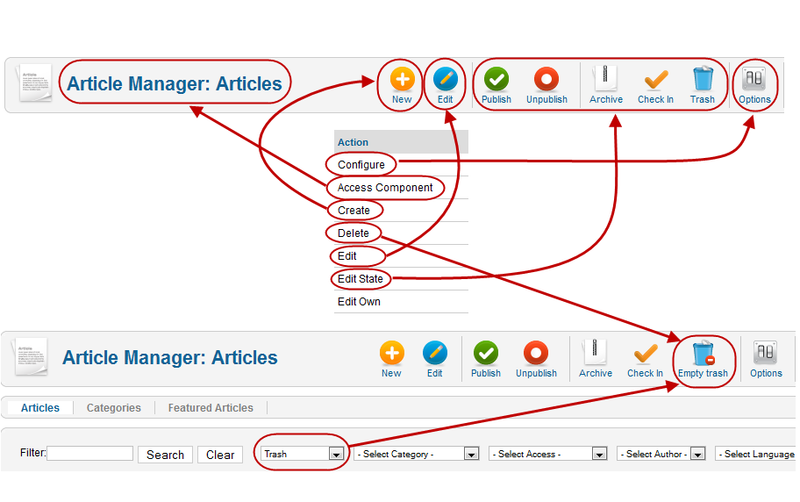 The Editor, Publisher, and Shop Suppliers groups are included, since they are child groups of Author. (Note that we could check all of the child groups if we wanted and it wouldn't hurt anything). This page was last modified on 19 September 2016, at 07:48.